Giving your child some little boys' underwear is a big event, especially because this means he's out of diapers and considered potty trained. What type of underwear should you choose for your little guy? Shopping for little boys' underwear can be a bit daunting, particularly if this will be your first shopping venture into the world of underwear for boys. Many parents allow their boys to choose their own underwear as an incentive for mastering the skill of potty training. This may be the reward you want to offer your little boy, but even if you do, you'll still want to steer him in the direction of the underwear you want him to wear. In other words, you choose the style-boxers, briefs, boxer-briefs, or compression-then allow your child to choose the design, like a superhero or automobile theme. Special needs-When choosing the style of your child's underwear, it's important to consider any particular needs or issues he might have. For example, children with a sensory processing disorder (SPD) are often very sensitive to various materials. For this reason, many parents are very particular about the underwear they choose for their child. Popular styles for children with SPD include tagless, seamless, and compression underwear. 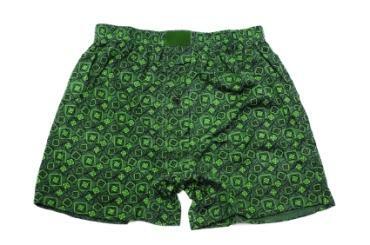 Boxers-While boxers are a common underwear choice for older boys, particularly teens, little boys who are just beginning to wear underwear typically find them a bit uncomfortable. This is mainly due to the fact that they have spent the first two or three years of their lives in diapers, and the unfamiliar loose fit of boxers may be too odd for them initially. If you really want your little boy to wear boxers, however, give him a few days to see if he adjusts to the fit. When purchasing little boys' boxers, be sure the waistband fits snugly but doesn't pinch your little guy's tender skin. Briefs-Most little boys start out wearing briefs when they switch from diapers or Pull-ups to underwear. They like the snugness of briefs, which provides a feeling somewhat similar to the diapers or training pants they've already been wearing. Briefs come in a variety of designs that cater to little boys' interests. Again, be sure you pay attention to the fit. Most little boys' sizes begin at 2T and go up. Boxer-briefs-This underwear is actually a cross between boxers and briefs. They fit like briefs, but they are longer in the legs, like boxers. Boxer-briefs are popular among older boys in particular, but your little guy may enjoy the fit and feel of this style of underwear as well. Athletic underwear-If your son plays any type of sport, then you may want to consider purchasing one or two pairs of boxer-cup combos. This underwear has a cup built right in, making it the smart choice for little boys who might balk at the idea of wearing a jock strap. Cold gear shirts-Under Armour is a popular choice for cold weather gear. Compression shorts-Your little one may not need these now, but as he grows older and gets more involved in athletics, you may want to purchase a pair or two. T-shirts-Choose from loose tees to sleeveless T-shirts to wear alone or under another shirt. Socks-You can find socks in a variety of styles, including crew-cut, low-cut, no-show, and more. As you can see, there are lots of choices when it comes to purchasing underwear for your little boy. The most important requirement in underwear selection, however, has to be comfort!